A desserted and backward Bathinda is making its way towards different scence not only in in Punjab, but North India also because of its achievements and growth idle. This district is developing at fleeting pace from last two years which has come to notice by India. Big Shopping Complex with a foreign brand, Big Grocery shop, Big Residential Colonies etc has opened in Bathinda. Mittal Group is one of the bigger who invested on Bathinda and gave it a unique identity. 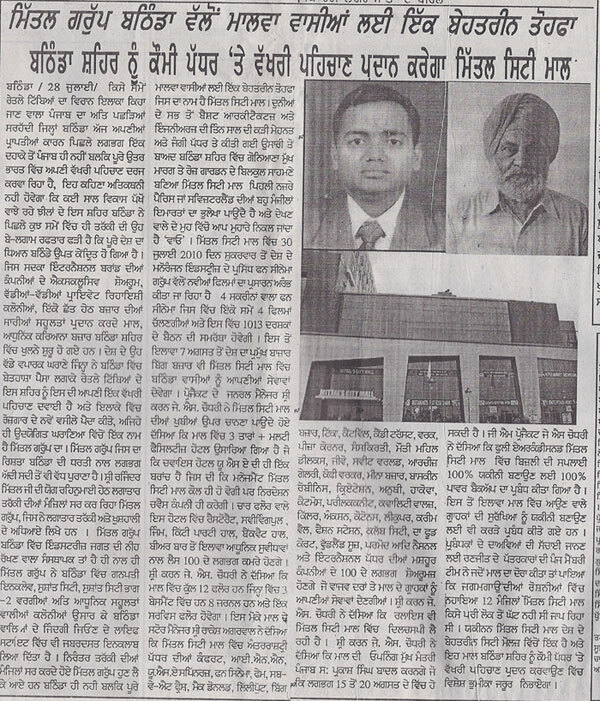 Mittal Group who have a relationship with Bathinda for more than 50 years is growing under the guidance of Sh. Rajendra Mittal. Apart from Setting largest chemical plant, it has provided to people for raising their standard of living with big and well-built colonies like Ganapati Enclave, Sushant City I and II. Now a new gift is introduced to Bathinda CIty I,e Mittal City Mall. Built by worlds best architectures and engineers, and putting 3 years of hard-work, Mittal Mall has come up as the greatest infrastructure. It has been appreciated by the people of Bathinda. It is located on Goniana road near rose garden. Fun Cinema is starting from 30 July 2010 and it has come up with four screens, four movies can run at a time. and has an arrangement of 1013 people. Col J.S.Choudhary told us that the opening of the mall will be done by chief minister Mr. Prakash Singh Badal between 15 to 25th August. Moreover, Big Bazaar will start from 7th August. Col. J.S. Chaudhary (GM Mall) told us that there is a hotel in Mittal Mall which will be 3-star having multiple facilities, it a chain of Choice Hotel (USA). Management will be of Mittal Group but the policies will be of choice.